ATSI is an organization rich in history with a wealth of knowledge and wisdom in its members. The key to the continuing success is the sharing attitude among its members. Founded in 1942, the Association of TeleServices International (ATSI) represents over 200 of the most sophisticated TeleService agencies in the world. 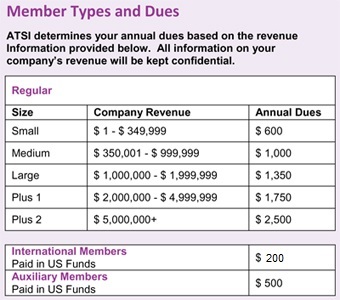 With over 350,000 customers in the U.S. alone, the members generate revenue in excess of $1 billion. For your first year of ATSI membership, your dues are HALF the normal rate - as low as $75/quarter! To Join ATSI, click here! For more membership information, click here! And that's just the beginning! ATSI also provides the long list of member benefits below. Representation — ATSI is the only national trade association representing the live telephone answering, voice mail and teleservices industry. Not only do we provide representation on a national level, but on a regional, and state-wide basis as well. ATSI's voice is heard before the U.S. Congress, the Federal Communications Commission, various state governments, and regulatory bodies as well as before the telephone companies. ATSI has been particularly successful in identifying the monopolistic advantages of the telephone companies and informing congressmen and state legislators of the danger of such advantages. We are a strong force in protecting the marketplace for the telemessaging industry. ATSI members engage in dynamic discussion on industry trends, hot topics, and information through an exclusive member-only list serve. How often do you train your agents for HIPAA compliance? Where do you find the best staffing resources? What equipment are you using? What are your best and worst hold times – and what did you do to improve? Your colleagues are here to share information and best practices! Annual Convention — an education program that provides practical information on a variety of subjects and alerts you to upcoming changes in legislation, telco competition, new technology and equipment. This is a unique opportunity to share ideas, problems, and solutions with your colleagues. The trade show and exposition, an integral part of the convention, provides you with an opportunity to view the latest in voice messaging equipment and technology. The conventions are open to all firms in the teleservices industry. Members of ATSI in good standing may attend the conventions at a substantial discount to the regular registration fee. Professional Liability Insurance — The risk of serious legal assessments caused by service mistakes make Professional Liability Insurance an absolute necessity in the teleservices business. Through its group purchasing power, ATSI continues to offer affordable insurance coverage for its members. Underwritten by an "A Rated Carrier" by A.M. Best and administered by Alliant Americas, this insurance program is available only to ATSI members. For more information, click here. ATSI Loss Prevention Hot-Line — If you are a subscriber to the ATSI Professional Liability Insurance Program, you have free, immediate and confidential access to experts in the legal defense and loss prevention fields. Award of Excellence — This is a program which recognizes the organizations in our industry who are judged to be the best of the best in providing services to the public. Each year all member organizations are given the opportunity to participate. The award follows more than six months of testing by a team of independent, specialized judges contracted by ATSI to evaluate message services. Organizations are judged on their courtesy, response time, accuracy and overall service to their clients -- the four cornerstones paramount to success in the TeleServices Industry. For more information, click here. Call Center Award of Distinction — This program is geared specifically geared towards call-center-type accounts. The Call Center Award of Distinction program focuses on Customer Relationship Management (CRM), courtesy, etiquette and proper call techniques of the Agents handling the application. This program assists you in assessing and controlling the quality of service you provide to this type of client. Additionally, winning the Award gives you an additional edge over your competitors. For more information, click here. Entertainment Discounts — members have access to exclusive savings on movie tickets, theme parks, attractions, hotels, tours, Broadway shows, Vegas shows, and much more! Seminars & Webinars — An ATSI service offered to members several times a year in different regions of the country. These excellent one to two-day seminars feature tips from industry experts on management, technology and marketing. ATSI is also now providing much of the same information in web-based seminars that do not require travel for you or your staff. Executive Management Forum — Open to owners and senior level management in the industry, ATSI offers high-level education on issues specific to owners, delivered by professional educators from the Kellogg Graduate School of Business and other high level graduate schools of business management. These unique forums allow for in-depth discussion of the topics on the agenda, along with plenty of time for discussion amongst attendees. Certification Programs — ATSI offers Site, Supervisor and CSR/TSR certification programs to the industry to help ensure performance at the highest level. For more information, click here. Interactive Training Programs — ATSI's Computer Based Interactive Training CD-ROMs allow you to assess, train and retrain your staff in basic Telephone Techniques, Call Center applications and Customer Service. These programs also offer Pre-Employment Application and Testing to assist you in hiring the right person in the first place. For more information, click here. Networking Opportunities — ATSI offers multiple opportunities for networking with your peers. Along with our Annual Convention, Owners Forums, Webinars and Virtual Round Tables, our most valuable tool is the ATSI email discussion list — where information and answers can be found within moments! Members who wish to learn more about the email discussion list are encouraged to call the ATSI office (866-896-ATSI) or send an email to [email protected]. Marketing Tools & Products — ATSI offers a variety of products, resources, education and tools to assist you in marketing your services. For more information, click here. The ATSI Marketing Committee created this video as a new tool that members can use in their marketing activities. ATSI members can personalize the last slide to include their own TAS’ contact information. For more information, click here. ATSI Education Foundation — formed to develop new programs specifically for the telemessaging industry. Projects include the development of a video training guide for sales, pre-employment screening tests, and more. The Education Foundation is a separate entity from the association and is supported by voluntary contributions from members. For more information, click here. Oasis Outsourcing — members receive discounted services with the second largest Professional Employer Organization (PEO) in the country. Oasis Outsourcing provides human resources, employee benefits, payroll administration, and workers comp insurance – a one-stop shop for TAS businesses of all sizes. They understand our industry and are ready to make a positive impact on YOUR company’s bottom-line. As an ATSI member, you are entitled to 40% off initial setup fees. To learn more click here!